What does electricity do to the body? Whenever the topic of electricity comes up, whether in social or professional life, a conversation about safety should not be far behind. Electricity is dangerous because it is seeking a path to ground, and you may be in the way of that path. Electricity will seek the shortest route to the ground, so if it reaches you on the way, you will become the path. The first thing you may note about the effect of electrical contact with the body is pain. Even static electricity from a doorknob can make a person feel varying levels of pain. At very low levels, electricity may feel like a minor tingle. In severe cases, it may feel like a blow to the body from a sharp instrument. The body is not actually a good conductor, but it is made out of water with salt, so electricity will opt for it over nothing. Because it is not a good conductor, resistance causes it to heat up. That is why electricity causes burns. Burns can be severe enough to cause organ damage. In more severe cases, electricity overloads the neurons that are responsible for controlling the body. This means muscles will involuntarily contract. This may knock a person to the ground when they loose control of their legs. It can also cause a person to become “froze on the circuit,” which is a term used when the hand involuntarily clutches around the item from which electricity is coming (i.e. electric fence). A person who cannot let go may die from electrocution. Only a break in the current can stop it. This is why you hear of people knocking those who are “froze on the circuit” away from the power source. This is not the recommended method, as both may suffer contracted muscles that cause them both to hold on to the source of electricity. A better way to stop this type of electrocution is to cut the source of the power as quickly as possible. If a person is electrocuted for a long enough time period, their vessels will also contract. This can seize the respiratory system causing cardiac arrest. This can easily result in death. Injury and death are the reasons why there are so many safety precautions to be taken when handling electricity. The best protection is to turn off all electrical sources near the work being performed. Switching off breakers is a good start, but sometimes circuits are not labelled properly. The only way to be sure there is no electricity running to a circuit is to test it with some sort of voltage tester. 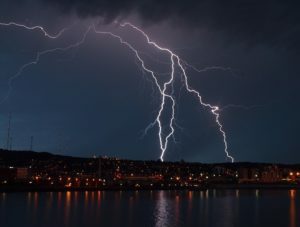 This is not just a warning about man-made electrical danger, and nature puts out the worst type of electrical danger in its lightning despite is rarer occurrence. One lightning strike may hold hundreds of kilovolts of energy, and it can heat up to tens of thousands of degrees. Still, it is rare to be struck by lightning. When a person runs inside to hide from lightning, they are most likely trying to avoid a direct strike. Little thought is given to the other, and more likely scenarios. Direct strikes are the most deadly, but they are very uncommon. Lightning has to strike right near the location of an unprotected person, and it uses that person as a path to get to the ground damaging the body on its way. Lightning can strike something else, and then travel through a nearby item even if that item happens to be human. This most commonly happens when people are trying to seek shelter under something tall like a tree. The lightning begins traveling down the tree then branches off to travel down the human. This is the most common way to be injured or die from a lightning. It happens when, instead of being grounded, lightning travels along the ground. You can be struck by lightning within the “safety” of your own home. This happens when lightning travels through the wires or metal pipes of a home. This makes it very dangerous to shower during a lightning storm, and you are only safe in the home during lightning if you are sitting away from metal piping and electrical sources. 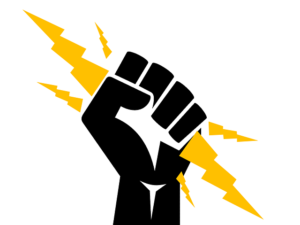 Streamer strikes are very rare, but it is essentially a lightning strike that branches off the energy of the primary strike. The charged air creates an additional strike. According to an article in Weatherworks, there were only 16 lightning deaths in the U.S. in 2017, and that is a significant decrease from 23 deaths in 2013. Not all of life’s hazards are easy to avoid, but with proper precautions, electrocution should not be difficult to avoid. The biggest reason is occurs is complacency and arrogance. People don’t give the power of electricity its due respect, and they suffer severe injuries and sometimes death as a result.